The academic commentary on the protection of the journalist in war tends to focus on the safety and security of the journalist. This is necessary but it is coming at the cost of the right of the public to “receive” information to make decisions about their democracy in wartime. The focus on the protection of the life of the journalists in wartime has a legitimate basis given the concerning statistics of journalist assassinations in war zones. Key international NGOs ‒ such as the Press Emblem Campaign and the Committee to Protect Journalists – campaign for justice for journalists reporting in war in response to tragic killings and threats of killings of the media. However, scrutinising the frameworks in international law reveals that there are additional priorities for journalists and the institutions they work for. Article 19 of the International Covenant on Civil and Political Rights states that the right to freedom of expression speaks of “the right to seek, receive and impart information and ideas”. Article 10 of the European Convention on Human Rights uses similar language. Crucially, according to these provisions, the public has the right to “receive” information which assists the public to make decisions in a democracy, including in times of war. The emphasis on safety and security tends to be at the expense of such requirements as the right to “receive” information. Journalism is not known as the only profession which requires safety and security measures such as security consultants and safety precautions – aid organisations, for example, take measures to protect their employees in insecure environments seriously. However, the implementation of safety and security mechanisms carries particular implications for rights under Freedom of Expression provisions and how journalists practice their profession. For example, because of restrictive safety considerations, it appears that journalists have been unable to develop sufficient rapport with sources and lack the ability to leverage such sources to get information, leaving many important stories untold. NGOs, social media activists and local journalists have been left to “fill the gap” in coverage and tend towards being more partisan and activist in their output. Unequal relationships between the source and the journalist, in particular, are increasingly undermining the right to receive information. In a conflict zone, journalists increasingly depend upon official sources of the dangerous climate for reportage. Books by Delmer D Dunn (1969) and Herbert J Gans (1969) have focused on the corrupting influence of official sources on the quality of information produced by journalists in a domestic setting. Mark Pedelty (1995), in his anthropological study of the conflict in El Salvador, has observed that some sources are extremely adept at using the media to spread their own misinformation. He found that staff correspondents for the major news corporations generally had links with embassy staff while stringers ‒ usually a local journalist supporting international media ‒ were more closely involved with the members of grassroots political organisations and international solidarity movements. The deterioration of information – resulting from the distorted relationship between journalists and sources – has led to the growth of “fake news” globally. Trends have also undermined the capacity of the war journalist – also referred to as “diplomat(s)” in some circles (Schumhl, 1984: 75) – to contribute to positive outcomes such as peace and stability in democracies rather than writing that undermines these goals (see Lynch, 2005 for a discussion of “peace journalism”). What are the possibilities for international law to address the inequalities of the journalist and source relationship in times of war, and therefore improve the right to receive information, to enable citizens to make informed decisions in a democracy? The enshrinement of the journalist source protection principle in international law is, in part, responding to the right to “receive” information in international human rights law. The safeguard of journalist source protection is enshrined so that all sources will talk to journalists and supply them with information without fear of forced disclosures of their identity, thus ensuring the free flow of information and ideas so that citizens can contribute to their democracy. Journalist source protection has been related to the right of the journalist to keep information relating to the identity of a source confidential under law regardless of the lack of safety and security. International law on this topic is evolving on the basis of challenges from the public and private sectors, for example, through mechanisms such as the European Court of Human Rights (ECtHR). Disclosure of source identity is often described as having a “chilling effect” on information; this reflects the supremacy of the “marketplace of ideas” theory, where the free flow of information unimpeded by the “chilling effect” enables citizens to find the “truth” about decisions pertinent to a democracy. The privilege is increasingly being cited by journalists in wartime, confirming that there is an unwritten ethical code of certain behaviours for actors in wartime. It is, for that reason, surprising that it took until 2002 (after the Balkans Wars in the 1990s) at the International Criminal Tribunal for the Former Yugoslavia (ICTY) that it was found that the source protection safeguard applies in situations of armed conflict for war correspondents, thus enshrining an ethical principle of journalism in International Law. The ICTY cited the European Court of Human Rights to make this finding. The finding accorded Jonathon Randal – a retired war correspondent ‒ the right to not disclose his sources from his work at the Washington Post in the ICTY proceedings. The principle is being extended by the Special Court for Sierra Leone to other actors in war, such as human rights workers. 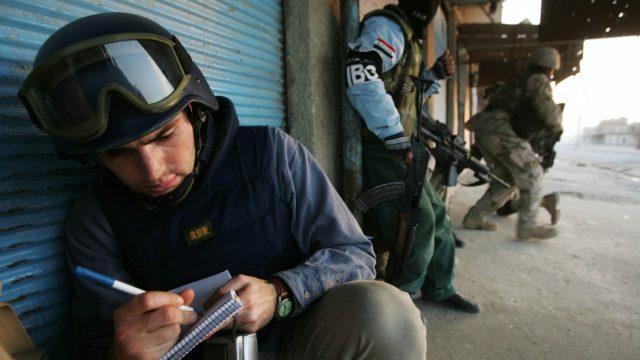 How does the right to journalist source protection safeguard work in war-time? Some commentators argue for a decreased role for the journalist source protection safeguard, recognising a broader right to “receive” information. Journalist Ed Vulliamy is known for his public stand on testifying before the international courts, advocating for the disclosing the identity of his war criminal sources in the name of justice for the victims of the war in the Balkans. Nina Burri, in her seminal book on the rights of journalists in war zones, has referred to this alternative point of view (2015: 326). Understanding what falls within the high standard of the exception to the qualified privilege in Randal’s case in international criminal law has also been significant. In Randal’s case, the Trial Chamber at the ICTY argued that evidence “pertinent to the case of the Prosecution” was enough to override the principle of source protection. The Appeals Chamber disagreed and found that “it is only when the Trial Chamber finds that the evidence sought by the party seeking the subpoena is direct and important to the core issues of the case.” Future decisions will provide further clarity about what the exception means for both the prosecution and the defence. What’s the way the forward? The relationship between journalist and their sources is likely to be subject to sanctions under international law. There are a number of principles in international law prohibiting speech crimes for certain behaviours ‒ including incitement to genocide – which may be customary law and could overrule the journalist source protection safeguard, including the Statute of the International Criminal Court. International law has responded harshly to journalists for their part in international crimes in Rwanda and Nazi Germany. It is unlikely that any court would uphold the journalist source protection principle in such extreme circumstances of media involvement in war propaganda and incitement. It should be noted that the principle of journalist source protection is not a customary rule of international humanitarian law, namely the set of rules regulating situations of armed conflict. Additionally, alternative frameworks less known in international law will define the parameters of the relationship between the journalist and source whilst aiding the right to “receive” information. Options such as the remedy of privacy for harm to dignity and person of sources, the whistle-blower protection for sources and the duty of confidentiality for the journalist and their source are all increasingly legal frameworks that address the quality of information through permitting certain types of journalistic and source relationships. All three areas are also values and principles part of the jurisprudence in international human rights law. It is also likely that future courts – perhaps the International Criminal Court – will have to further define the parameters of these little-explored issues and see how they fit the evidentiary threshold. The recognition of the safeguard of journalist source protection in international law has increasingly led to a significant opportunity to enhance the journalist and source relationship in times of war and therefore the right to “receive” information in a democracy. Simon is a lawyer and candidate for a PhD at Western Sydney University specialising on the international protection of journalists. He has also worked for the ABC Radio National. He has advised the Human Rights Council of Australia, Australian Lawyers for Human Rights, the United Nations Office of the High Commissioner for Human Rights, the International Criminal Tribunal for the Former Yugoslavia, the Diplomacy Training Program and other organisations on international human rights and criminal law. He was a Lecturer-in-Law at the University of New South Wales and Western Sydney University and a Legal Officer at the Royal Commission into Institutionalised Responses to Child Sexual Abuse. He has worked on Australian Research Council Grants for the University of Technology, Sydney, and was a Senior Research Assistant working on the biography of Justice Michael Kirby.